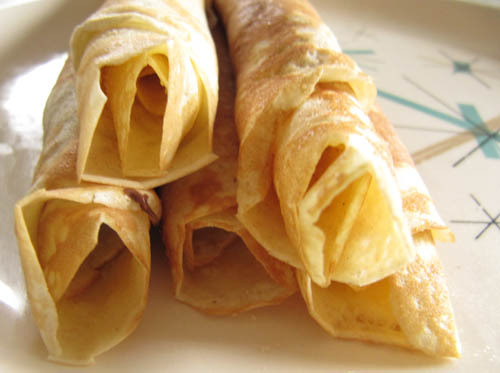 These are the crepe cousin I’ve been dying to meet. They cook at a higher heat and get pretty tan lines. They don’t speak French. 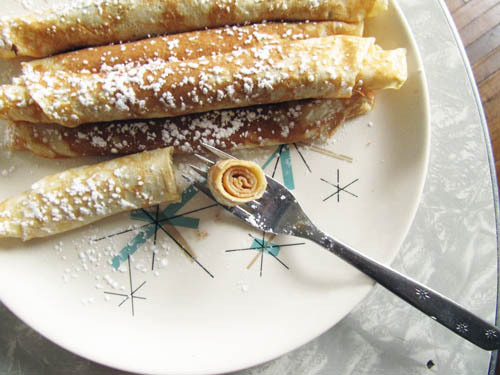 They are tasty with cinnamon sugar, and nutella. Most things are, though. These are fun to roll up. You might want to make them just for all the rolling action. And look! You can end up with a bouquet of pancakes for breakfast! And the truth is, I’d always choose pancakes over flowers. Sprinkling them with powdered sugar just takes them from good to goo-ood. Extra syllables mean things are even better than you can imagine. And it’s really fun that the bites are swirly twirly. Beat eggs until super frothy. Add milk and melted butter and beat until combined. Add sugar and continue to beat until dissolved. 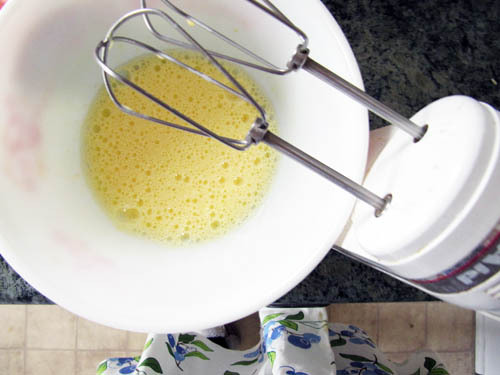 In a separate bowl whisk together the flour and baking powder. Add flour mixture to wet ingredients. Stir until combined. Don’t beat! The batter will be lumpy, but it’s ok.
Heat a nonstick frying pan or crepe pan to medium high. Spray lightly with cooking spray. Using approximately 1/8 cup of batter, pour into a thin circle. 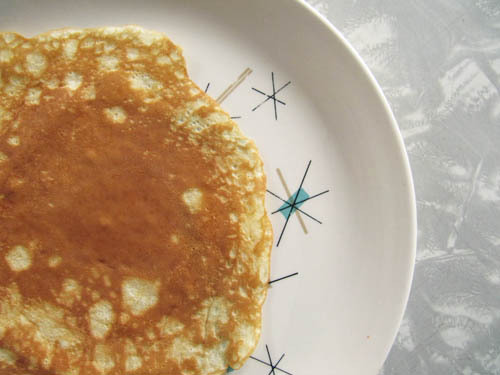 When the top of pancakes has a lot of tiny holes, turn it over for about 30 seconds. Remove from pan, sprinkling with cinnamon sugar or spread with Nutella or jam. Roll it up tightly and enjoy! This is Elliot in a Swedish Pancake costume. 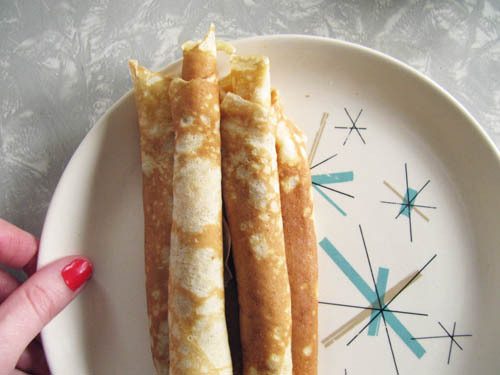 There is a fine line between “Swedish pancakes” and taquitos. And now I’m hungry for taquitos. Shoot. 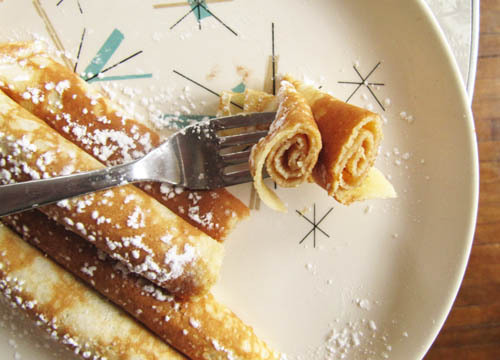 I have been DYING for crepes and these look even better! I am going to make them tomorrow, most definitely! Maybe one with Nutella, and a couple German style (lemon, butter and powdered sugar). I might even go crazy and try a savory one, with super thin sliced ham and a sprinkling of cheese. Or maybe smoked salmon and creme fraiche. Thank you for this! Oh my stars…lovin’ my cutie patootie crepe-ish fuzzy nephew. 😉 And these pancakes look heavenly! 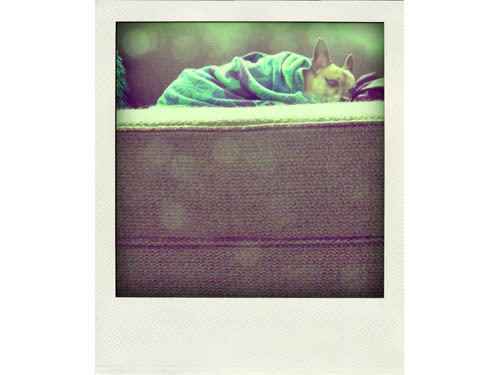 He loves to be all tightly wrapped in blankets. 🙂 I bet you’d love these! did elliot get the first pancake? swedish pancakes are awesome! i love that retro plate too. He totally should’ve based on his costume skillz. Aw- Elliot is so cute 🙂 And these pancakes remind me of the ones I got and LOVED at the Pantry! Think I know what I’m gonna make on Saturday morning! Kramer is always trying to get me to make crepes, but I’m honestly not a huge fan – I think this might be just the thing to get me on the right track again. 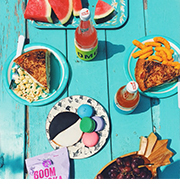 I love the photo of the cross-section! I bet you’d like these guys though! They are just enough different from crepes. They’re lighter a bit. 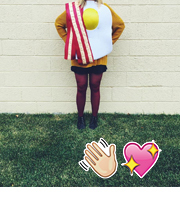 <3 And thanks for the photo love. this is real polish taste too, i love it! Ooh good to know! All I know is that they are delicious.